An interesting discussion on the Pedagogy First course blog has sparked off further thoughts about issues around ‘openness’. This post is, in part, a response to some of the thoughts posted by Alan Levine, and the responses of others, which have provoked this further thinking. Martin Weller has said that ‘Openness is a state of mind’. Overall I agree with this, but is openness context dependent? My mind isn’t your mind, my experience might not be your experience, my location won’t necessarily be your location and so on. How we understand and experience openness is individual to each learner. Carmen Tschofen and I discussed this in our paper – Connectivism and dimensions of individual experience. No place is it more important to remember this, than in a small course/community/MOOC in which novice learners are working alongside ‘expert’ or experienced learners and where the topic is learning to teach. 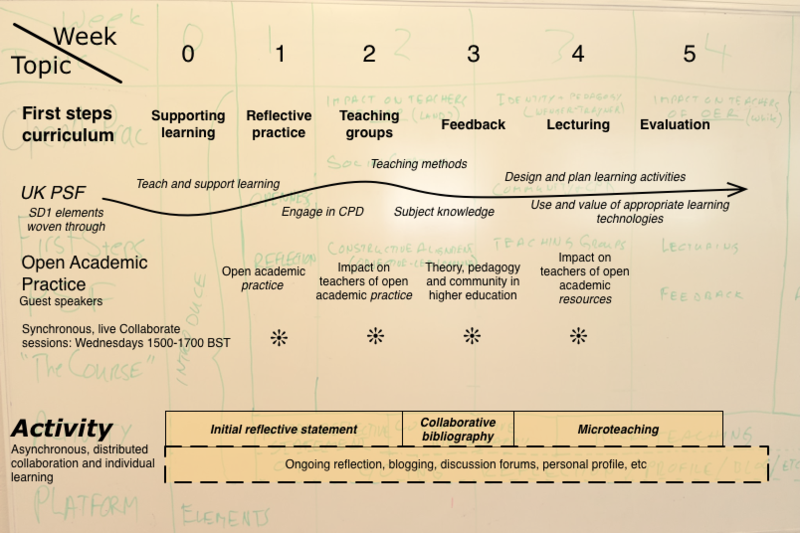 FSLT12 was such a course, and so too is Pedagogy First – they are both small open online task-oriented MOOCs focusing on developing learners as teachers/lecturers/facilitators, with an emphasis on developing an understanding of pedagogy. In addition, both these courses are offered for assessment, so, for example, an assessment requirement of the Pedagogy First course is for regular blogging and open sharing of completed tasks; the first task for assessment in FSLT12 was open reflective writing. ‘Openness’ in these circumstances is no mean feat. Experiences of learners new to working in online environments have been well researched (Sharpe and Benfield, 2005). Feelings of over-exposure, isolation, inability to cope with navigating the online environment, inability to cope with the abundance of information, the lack of visual cues to support interpretation of others’ comments, feelings of disorientation, not knowing how to balance time on and offline, feelings of anxiety and intense emotional responses – are all common examples of how people new to the online environment might feel. But in an open course we have people with these experiences working alongside ‘veteran’ MOOCers who are familiar with the chaotic complexity and hustle and bustle of the open MOOC market place. These veterans enter an open network knowing what to expect. So how do we bring these two groups together? In the Pedagogy First course, there has been a call for mentors, meaning that there is an expectation that experienced MOOCers will support novice MOOCers. As part of the Pedgaogy First programme we have been asked to buy the book – Susan Ko and Steve Rossen (2010) Teaching Online: A Practical Guide (3rd ed) Taylor and Francis – and I am looking forward to reading what it has to say about initiating newcomers into an online course. My copy is in the post! In the meantime I am revisiting my well-thumbed and very familiar copy of Gilly Salmon’s book ‘e-Moderating: The Key to Teaching and Learning Online’. 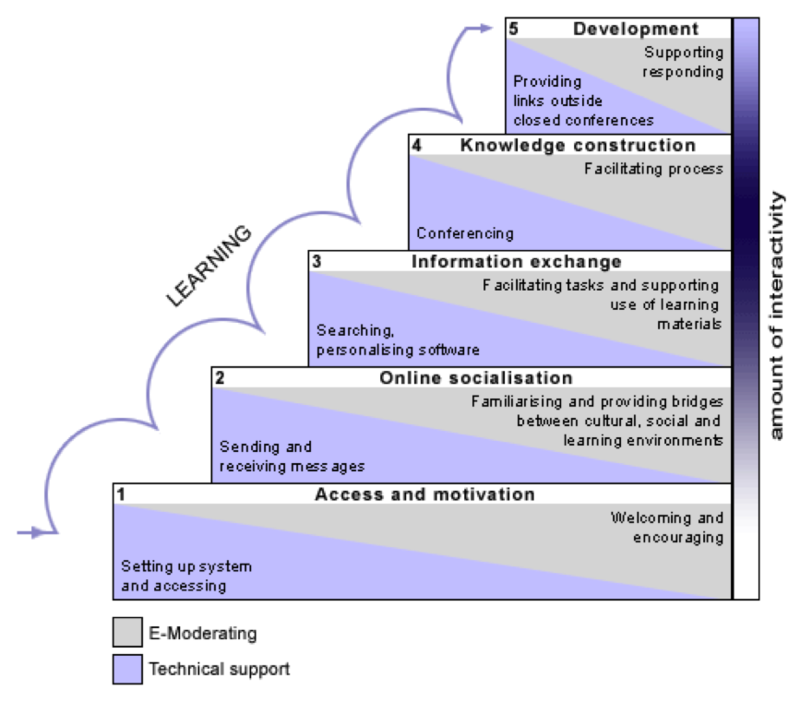 In this she presents a 5-stage model for facilitating online learning. In my experience, following this model helps to avoid a lot of the pitfalls associated with online learning. Salmon recommends starting with ensuring access, as has been done in the Pedagogy First course, and focusing to begin with on socialization, which she says helps to ensure the success of an online course. Socialization will of course continue throughout the course, but it is necessary at the beginning to develop the sense of belonging and trust needed to enable later, weightier and more challenging discussions. Salmon says these discussions happen at Stage 5 – ‘different skills come into play at this stage. These are those of critical thinking and the ability to challenge the ‘givens’ (p.48). ‘Openness’ as a ‘state of mind’ takes time to develop. It is not a given and cannot be assumed. It should not even be expected, if we believe in the autonomy of learners, i.e. freedom to choose. But if we want it in our MOOCs (thinking here of MOOCs as ‘courses’ as in the case of Pedagogy First) then we should allow time for ‘novices’ to work through the 5 stages of Gilly Salmon’s model. Veteran MOOCers may need to hold back, or at least carefully consider how their posts might be interpreted by novices. This doesn’t necessarily apply to an open network or even to a MOOC such as CCK08, but I think it does apply to a MOOC that has been designed for novices and where there is a recognition that novices will need mentoring. For me when I facilitate or convene an online course/MOOC I hope that the course design/environment will encourage the development of autonomous and connected learners who embrace openness, alternative perspectives and diversity, and engage in critical thinking, stimulating dialogue and reflective learning. This will not happen if they ‘drop out’ in the early stages. One of the criticisms of MOOCs is the high drop out rate. Stephen Downes has said, to teach is to model and demonstrate, and to learn is to practice and reflect. So maybe modeling and demonstrating, practicing and reflecting on Gilly Salmon’s model is not a bad place to start for small task-oriented MOOCs. And finally, perhaps in the case of small MOOCs it is easier to think of them as open courses rather than open networks. Maybe this would bring a different perspective to the way we work in them and what our expectations might be. Dave White’s presentation to FSLT12 yesterday included a number of thought-provoking ideas. Click here for the recording of the session. or those below the water line – where licensing is not so important. These below the water line resources are easy access , free and easy to remix and repurpose, without much attribution. This happens a lot below the water line. What effect has access to OERs, above or below the water line, had on the way we teach and learn? I remember when MIT first opened access to their educational resources, this was accompanied by a statement to the effect that it was not an issue for them to open their content to the world – because the educational value and quality they provide is not so much in their content, but in their teaching and learning. To get this we have to pay to go to MIT. Now that we have more clarity around what we are allowed to do with OERs (through Creative Commons Licences), we can remix, repurpose and feed-forward OERs (to quote Stephen Downes). We can be more creative. 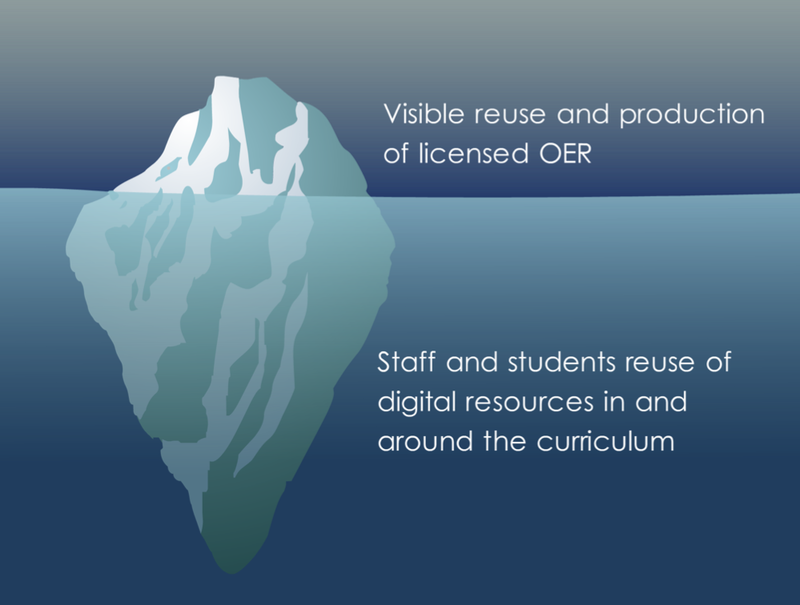 Perhaps OERs also enable us to challenge the ‘status quo’ – in the sense that ‘credible, quality’ content might no longer always be in peer reviewed journals, articles and academic sites, but might instead be on ‘John or Jane Doe’s blog’ or deep below the water line (iceberg metaphor). They do tend to force more critical thinking and the framing of critically relevant questions, e.g. what is a credible, quality resource? How do we recognize it? And this in turn raises the whole question of whether learners have the skills to navigate the web to find the quality resources. And from the teacher’s perspective, as Dave pointed out, we will have to come up with assessment tasks that don’t allow the student to simply find the answer through an easy access easy to find OER. This has always been a challenge for teachers, but even more so now. Dave’s final slide quotes Harouni (2009). For me living with uncertainty is the big paradigm shift we might need in today’s digital world. Roy Williams, Regina Karousou, Simone Gumtau and I have been exploring this in our papers about emergent learning – and Dave Cormier raised this as a key point in his presentation to the in the ‘New Places to Learn’ – NewPlacesEvent HEA event held at the Said Business School in Oxford in April of this year. Hopefully discussion about how OERs affect pedagogy will continue in the FSLT12 Week 4 Moodle discussion forum There is still lots to talk about. How can openness benefit my practice? What risks are presented by open academic? What impact is your participation in #fslt12 having on your personal network? What role can openness play in learners’ practice? But when I recently wrote a blog post raising the question (in response to a post by George Veletsianos)…..
Is openness becoming a ‘tyranny’ that we are all just drifting into? Or is openness essential to the future of education and scholars? First, nobody’s imposing anything here; if you want to go back to your structured formal education, where you pay a substantial fee, there are thousands of institutions who would be happy to help you. Second, the openness (and the rest of it) is the result of a critical examination. As I have argued with respect to the principles of successful networks, if you want your social organizations to be effective at all, you need to embrace things like autonomy, openness, interatcivity and diversity. This was on the 18th May and I have been thinking about it since because I have a great deal of respect for Stephen, but for me the answers to the questions are less clear cut. I think in the context of Higher Education the problem is that we are in structured formal education, where, if we want to keep our jobs, we sometimes do have to conform to the institution’s requirements – and that may or may not include a requirement for openness. I should say here that I am not in this situation (I am an independent consultant), but I have been in the past and I know from experience that resistance to an institution’s principles might mean handing in your notice, which is probably not an option for many people – although I have done this twice in the past, and fortunately on both occasions was able to move straight into another job. So I think in certain circumstances, openness could be imposed if you do not have the autonomy to resist it. But I do agree with Stephen that openness is the result of critical examination – which I think fits with Frances’ statement that openness can be thought of as a default option. As she said in today’s session it will not be for everyone in every situation. We each, individually need to decide how open to be, when and where. So what might be the benefits? I know that the benefits can be considerable, although I think I benefit more from others’ openness than being open myself. I get access to free information and a wide range of alternative perspectives. More importantly I receive support and encouragement from people I may not even have met. People’s generosity through openness on the web and indeed in this FSLT12 MOOC never fails to amaze me. I really don’t understand why anyone would want to be open (different from honest in that we can choose not to say certain things) all the time – some remarks are better kept from the public gaze. Openness is not straightforward. It clearly means different things to different people according to their context and it may be something that we cannot take a stance on in the moment. I suspect it may take considerable experience and time to determine what openness means on a personal level and how that understanding will be reflected in our personal practice.